How to install LED under car lights. 2.1 Million Color changing LED Undercar kit, or the flexible LED undercar kit that are sold on this website, and including other brand name LED light kits. For what-ever type of LED undercar lights you have, these "how to wire led lights in car" instructions should serve their purpose well. The main differences between "color changing LED undercar kits" and "single color LED undercar kits, is that the color changing kit has an advanced digital control panel associated with it to give you numerous functions, where-as the "single color" doe's not. Whilst the installation for the LED tubes for both types of kits remain the same. So the actual installation of components for these two different kinds of kits is very much the same. Note: For those of who have purchased undercar kits from this site, whether it be LED or Neon, be sure to fill out your "Life Time Warranty card" immediately and send it to Plasmaglow within 30 days of purchase so it will remain valid. Bare in mind that the main issue we face with having neon or LED car lights on our vehicles these days is the fact that they are often frowned upon by the authorities. So to avoid any uninvited fines, and to have total control at your fingertips, its best to install neon or LED lights so as they can be activated through a separate Expandable Control Switch for ease of use, rather than having them come on when the headlights are turned on. If you do have your neons come on when the ignition is turned on, your best bet is to have a "kill switch" installed to get you out of trouble, should the police be on the prowl, or if there is some "overheating" going on. In order to be able to install this kit you're going to need a few tools and materials. How to install LED lights under car Step 2. Before doing *Any* electrical work on a vehicle, always disconnect the vehicles battery before starting. (be aware that in later model cars, disconnecting the battery can disrupt the cars electronic systems). This can be done by disconnecting the vehicle's negative battery cable. It's also wise to have your vehicles service manual handy for information about the specifics of the electrical system on your vehicle should you need it. The installation below involves disconnecting the battery first and formost. Please refer to These Instructions here for further "in-depth" instructions. Important: For any vehicle project that involves drilling holes into the body, its a good thing to first check the locations where you're going to mount LED/Neon hardware to be certain you won't pierce or damage any crucial parts such as brake lines, fuel lines and electrical lines, etc, that would be a real shame! How to install LED under car lights Step 3. Determine a location for tube placement that is away from all fuel lines, exhaust systems, areas of extreme heat, moving parts, areas where a lift jack are used to raise the vehicle, or where a spare tyre is accessed. With the vehicle raised up on a lift or jack (be absolutely certain the jack is safe before laying under the car) test-fit the LED light tubes in the locations where they will be mounted in accordance with your particular kit diagrams and instructions. It is ideal to mount the led tubes so as they are centered between the overall length of the vehicle for optimal appearance, but this is also a matter of personal preference. Tubes should be positioned on the chassis of the vehicle so as they are not visible. Visible tubes are prohibited by law in some countries and States. How to install LED under car lights Step 4. The LED tubes are mounted on the chassis using the small metal/plastic brackets that are included in your kit. With the brackets installed on the tube first, lift the assembly into place and mark the locations where you will be drilling the holes for the brackets. Once you have marked the locations with an ink marker or pencil, center-punch them to ensure a good start for your drill bit. Carefully drill the holes for the mounting brackets. As with any project that involves drilling holes into metal parts on a vehicle, apply a small amount of silicon sealer to the holes before screwing in the screws. This will help protect the metal against rust. The easiest way to mount the LED tubes is to start the screws in the brackets first, then holding the bracket in place, insert and tighten the screws into the holes. Make sure that the wires coming from the *Side* tubes are facing the front of the vehicle so that they are closer to distribution block. It's best to tighten the screws just enough to hold the bracket in place, then go back after you have almost finished the install and individually tighten each one until it seats firmly. For this step, you may use either a screwdriver attachment for your cordless drill or a regular screwdriver. Once you've correctly mounted the first led tube assembly, proceed to the other tubes and install them in the same manner. Just think...pretty soon you'll be able to show all your friends how to install LED under car lights in their cars too, and maybe even get paid! How to install LED under car lights Step 5. Find a good location for the distribution block. It should be mounted on a flat surface in the engine compartment. If you live in extreme cold weather conditions, it's advised to try and mount the block inside the car and hidden away under the dash to avoid the moisture and any friends kicking it. It should be mounted away from extreme heat and moving parts. It is better to mount the distribution block high in the engine compartment to ensure that it stays dry, should you choose this location. Connect each tube to the outputs on top of the distribution block (Plasmaglow LED undercar kit). Several wire extentions are included in the kits from plasmaglow, in case the existing wires do not reach. Once you have plugged in these wires into the distrubution block, DO NOT pull the adaptors out by the wires. They can be prised up using a flat head screwdriver. Should you have to do any cutting and joining of wires for led under car kits from other manufacturers, other then Plasmaglow, it is advised to; A) strip back the ends of each of the wires that your going to join about 1/4-inch. B) Slip a length of "shrink-wrap tubing" over one end of each set of wires.C) Solder the exposed portions of the connecting wires together using a soldering gun.D) Add a dab of silicon sealer to the soldered connection.E) Slide the section of "shrink-wrap tubing" over the connection, then use a heat-gun to shrink the tubing to form a watertight seal. How to install LED under car lights Step 6. Determine a location inside your vehicle to mount the digital control panel. You want it to be in a location where you can easily access all its buttons and functions. How to install LED under car lights Step 7. The ribbon wire on the digital control panel needs to be pushed through a hole in the firewall and plugged into the "input" on the side of distribution block(Plasmaglow). For those of you who may be a bit confused as to what the "firewall" is, it's the wall that devides the engine compartment from the interior of the vehicle. Be careful when you do this because the wire adaptors are fragile. Make sure that the hole you pass the wire through is sealed with a rubber gromet or silicon sealant to protect wires. DO NOT pull on the adaptors, as the wires can come loose. An extention cable is included in the kit in case it will not reach the distribution block. How to install LED under car lights Step 8. The power wire on the digital control panel should be connected directly to the Positive side of the car battery, with an "in-line fuse" attached no more then 18 inches away from the battery. 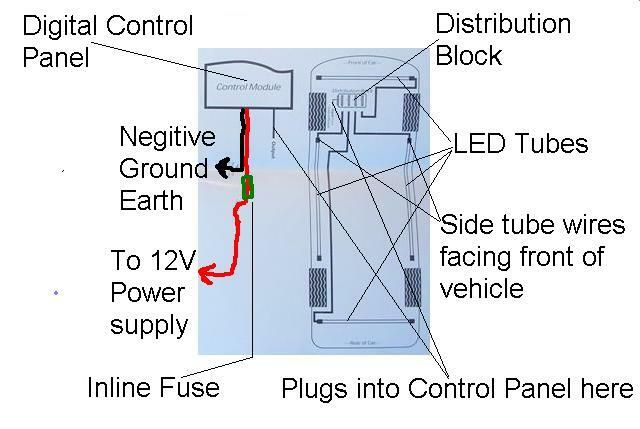 There will also be an "Earth wire" or Negative ground wire coming out from the control panel that will need to be sucurely screwed to the chassis of the vehicle or to any "existing earth wire" to complete the power circuit. Please refer to These Instructions here for further "in-depth" instructions on where-and-how to connect to the car battery. WARNING: Please keep in mind that the main issue we face with having neon or LED car lights on our vehicles these days is the fact that they are often frowned upon by the authorities. So to avoid any uninvited fines, and to have total control at your fingertips, its best to install neon or LED lights so as they can be activated through a separate Expandable Control Switch for ease of use, rather than having them come on when the headlights are turned on. If you do have your neons come on when the ignition is turned on, your best bet is to have a "kill switch" installed to get you out of trouble, should the police be on the prowl, or if there is some "overheating" going on. Another Word of Caution on how to install interior car lights, BE WARNED, if you do obtain a 12V power supply for your LED/Neons from one of the wires under the dash, be sure that it's not the headlight wires, because you cannot turn the neons or LED's off while driving at night, (unless you have an in-line switch) and be twice as sure that the wire your tapping into has 12volts of power running through it by using a voltage meter and circuit tester, refer to These Instructions Here for further "in-depth" instructions and be tripply sure to install a fuse on the power wire going to your LED/Neons. The included switch and fuse should be connected between the control panel and the power supply. Do not use any wires that are over 10 gauge for the power wire. If you need to lengthen the wires, be sure to solder, insulate the connections with electrical tape, silicon or heat shrink tubing to unsure a water tight connection - Again, see the main Instructions Page for more information. How to install LED under car lights Step 9. LED Tubes from Plasmaglow have directional light. The end caps on the tubes rotate, so as to optimize lighting performance on different vehicles. In most cases,the ideal glow is obtained by aiming all the LED tubes towards the outside of the vehicle. However, you may rotate the tubes in any direction to achieve the lighting effect you desire. Installation is now complete....I hope you have found these "How to install LED under car lights" instructions helpfull. Enjoy!! If these instructions all seem a little "over-whelming" - then your best bet is to print out these instructions and read them through a few times to familiarise yourself with what you need to do. Then when your ready, have these instructions with you while your installing the LED or Neon car lights into your car. And if your still un-comfortable with this installation - and feel that you can not do it, then your going to need to contact a professional who can. There are a growing number of car accessory installers that show you how to install LED under car lights, just ring around at a few places to find out who will do this installation for you. How to Install LED Under Car Lights- Back to Home Page.